Management Act, which was passed in 1976. The Magnuson Act estab- lished exclusive U.S. management of fisheries out to 200 miles off our shores and gave priority to U.S. fishermen and vessels for receiving fish quotas within the 200-mile limit. 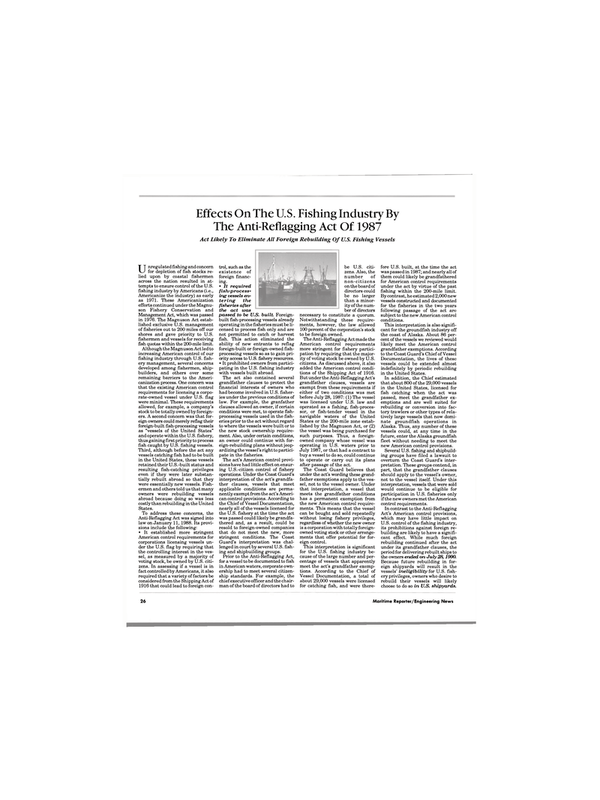 Although the Magnuson Act led to increasing American control of our fishing industry through U.S. fish- ery management, several concerns developed among fishermen, ship- builders, and others over some remaining barriers to the Ameri- canization process. One concern was that the existing American control requirements for licensing a corpo- rate-owned vessel under U.S. flag were minimal. These requirements allowed, for example, a company's stock to be totally owned by foreign- ers. A second concern was that for- eign owners could merely reflag their foreign-built fish-processing vessels as "vessels of the United States" and operate within the U.S. fishery, thus gaining first priority to process fish caught by U.S. fishing vessels. American control requirements for corporations licensing vessels un- der the U.S. flag by requiring that the controlling interest in the ves- sel, as measured by a majority of voting stock, be owned by U.S. citi- zens. In assessing if a vessel is in fact controlled by Americans, it also required that a variety of factors be considered from the Shipping Act of 1916 that could lead to foreign con- trol, such as the existence of foreign financ- ing. • It required fish-process- ing vessels en- tering the fisheries after the act was passed to be U.S. built. Foreign- built fish-processing vessels already operating in the fisheries must be li- censed to process fish only and are not permitted to catch or harvest fish. This action eliminated the ability of new entrants to reflag foreign-built or foreign-owned fish- processing vessels so as to gain pri- ority access to U.S. fishery resources. • It prohibited owners from partici- pating in the U.S. fishing industry with vessels built abroad. The act also contained several grandfather clauses to protect the financial interests of owners who had become involved in U.S. fisher- ies under the previous conditions of law. For example, the granfather clauses allowed an owner, if certain conditions were met, to operate fish- processing vessels used in the fish- eries prior to the act without regard to where the vessels were built or to the new stock ownership require- ment. Also, under certain conditions, an owner could continue with for- eign-rebuilding plans without jeop- ardizing the vessel's right to partici- pate in the fisheries. Guard's interpretation was chal- lenged in court by several U.S. fish- ing and shipbuilding groups. Prior to the Anti-Reflagging Act, for a vessel to be documented to fish in American waters, corporate own- ership had to meet several citizen- ship standards. For example, the chief executive officer and the chair- man of the board of directors had to be U.S. citi- zens. Also, the number of non-citizens on the board of directors could be no larger than a minor- ity of the num- ber of directors necessary to constitute a quorum. Notwithstanding these require- ments, however, the law allowed 100 percent of the corporation's stock to be foreign owned. American control requirements more stringent for fishery partici- pation by requiring that the major- ity of voting stock be owned by U.S. citizens. As discussed above, it also added the American control condi- tions of the Shipping Act of 1916. July 1987, or that had a contract to buy a vessel to do so, could continue to operate or carry out its plans after passage of the act. The Coast Guard believes that under the act's wording these grand- father exemptions apply to the ves- sel, not to the vessel owner. Under that interpretation, a vessel that meets the grandfather conditions has a permanent exemption from the new American control require- ments. This means that the vessel can be bought and sold repeatedly without losing fishery privileges, regardless of whether the new owner is a corporation with totally foreign- owned voting stock or other arrange- ments that offer potential for for- eign control. Vessel Documentation, a total of about 29,000 vessels were licensed for catching fish, and were there- fore U.S. built, at the time the act was passed in 1987; and nearly all of them could likely be grandfathered for American control requirements under the act by virtue of the past fishing within the 200-mile limit. By contrast, he estimated 2,000 new vessels constructed and documented for the fisheries in the two years following passage of the act are subject to the new American control conditions. Documentation, the lives of these vessels could be extended almost indefinitely by periodic rebuilding in the United States. Alaska. Thus, any number of these vessels could, at any time in the future, enter the Alaska groundfish fleet without needing to meet the new American control provisions. Several U.S. fishing and shipbuild- ing groups have filed a lawsuit to overturn the Coast Guard's inter- pretation. These groups contend, in part, that the grandfather clauses should apply to the vessel's owner, not to the vessel itself. Under this interpretation, vessels that were sold would continue to be eligible for participation in U.S. fisheries only if the new owners met the American control requirements. U.S. control of the fishing industry, its prohibitions against foreign re- building are likely to have a signifi- cant effect. While much foreign rebuilding continued after the act under its grandfather clauses, the period for delivering rebuilt ships to the owners ended on July28, 1990.